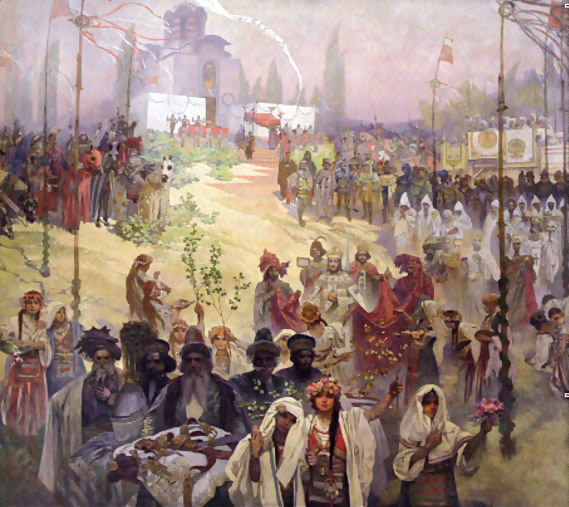 Alphonse Mucha was born in the small town of Ivančice, Moravia (now the Czech Republic) of lower middle class parents, in a atmosphere of Nationalism fostered by the Pan Slavic Movement. His love of his native country was an informing influence all of his life. His later years were spent on the creation of a monumental series of paintings glorifying Czech history, entitled "The Slav Epic." As a young man Mucha moved to Vienna and studied art and calligraphy, working as a scene painter and a portrait painter to support himself. 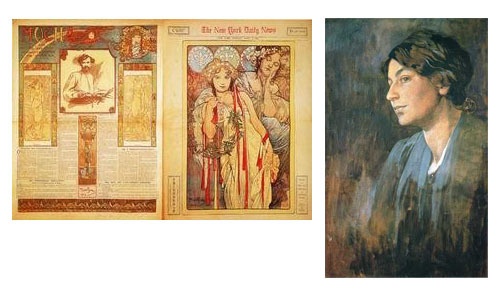 His work caught the attention of Count Karl Khuen of Mikulov who hired Mucha to decorate Hrušovany Emmahof Castle with murals and was impressed enough that he agreed to sponsor Mucha's formal training at the Munich Academy of Fine Arts. In 1887 he moved to Paris, where he worked as for various printers and magazines as an illustrator and calligrapher. 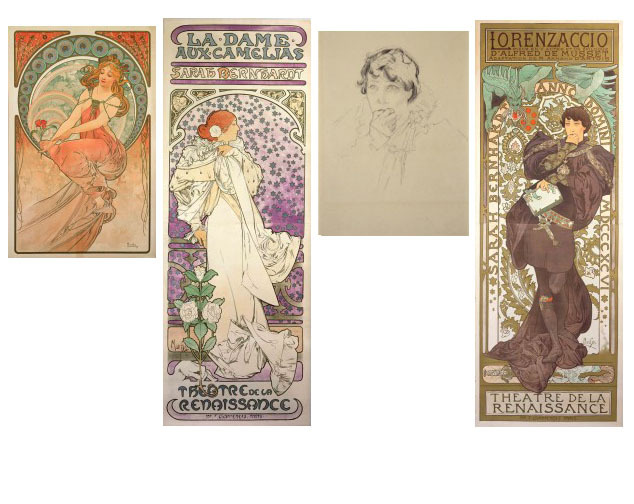 Mucha's big break came in 1894, when a poster he created for Sarah Bernhardt's performance of "Gismonda" met with her enthusiastic approval and she contracted with him to create posters for her for the next 6 years. 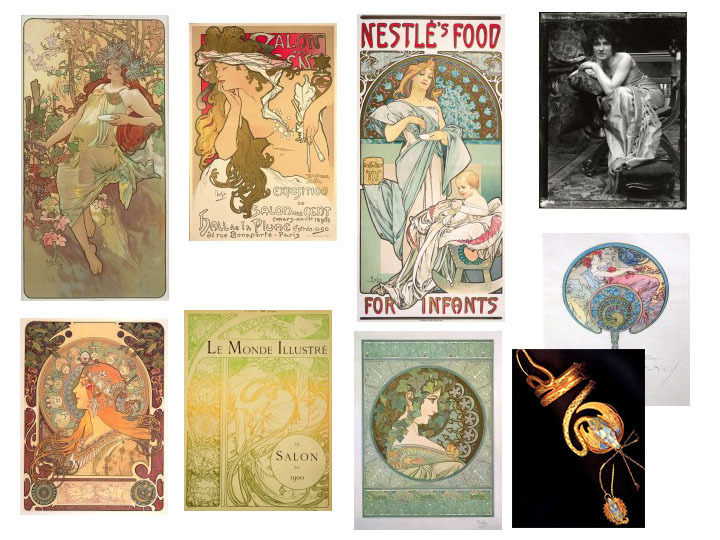 The 'Divine Sarah' was the toast of Paris, and Mucha's association with her catapulted him into commercial fame and fortune. Mucha later said that what he remembered most about that period was that he was exhausted, and indeed the amount of work he produced was prodigious. He made several trips to America, doing commercial illustration, portraits and murals. Alphonse and his family eventually returned to the Czechoslovakia and settled in Prague. There he decorated the Theater of Fine Arts, created the murals in the Mayor's Office at the Municipal House, and other landmarks around the city. When Czechoslovakia won its independence after World War I, Mucha designed the new postage stamps, banknotes, and other government documents for the new state. Appropriately, today the largest private collection of his work is held by the Czech tennis great, Ivan Lendl.